Submitted by nikobus on Fri, 2017-03-17 09:58. Thanks for the script, is awesome!! Anyway to use PSD Manager or any other effect in the render output? This is the only missing thing. Submitted by mali on Thu, 2017-03-09 09:11. There seems to be a bit of a change in the denoiser workflow in V-Ray 3.5. With 3.4 the script would save RGB color element as the main output and the denoiser element separately, but now with 3.5 the main output is the denoised result. So I get 2 identical denoised images saved. Submitted by meerarajput on Wed, 2017-03-01 01:29. Submitted by SUPERCOMBO on Mon, 2017-02-27 02:46. The settings of LightSelect elements delete max preset option, not Batch Camera Render, sorry about I had not noticed it before. Script is awesome, may thanks! Submitted by sergo on Fri, 2017-02-24 07:55. Submitted by SUPERCOMBO on Thu, 2017-02-23 23:25. 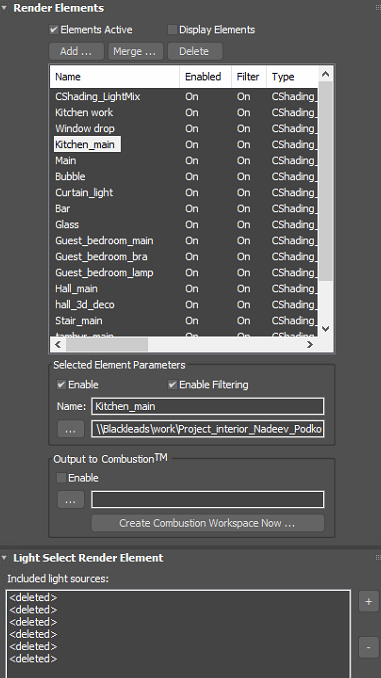 After setting up light elements on render ellement window and pressing render, Batch Camera Render delete all lights in eveti element. Submitted by Dariusz on Wed, 2017-01-25 04:35. Can it use camera name? Can this script use camera name and prefix? - it can. Amazing piece of code!!! THANK YOU! Submitted by happydaydreamer on Fri, 2017-01-06 03:30. Maybe I misunderstand you, but the scene states and state sets are two different things. Try to make two different scene states (not state sets) and see if that works. Submitted by pixelab on Mon, 2016-12-12 02:29. Submitted by sergo on Sat, 2016-12-10 22:00. I could not model the case to make that string in the script to fail. Is the crash random or it happens all the time?